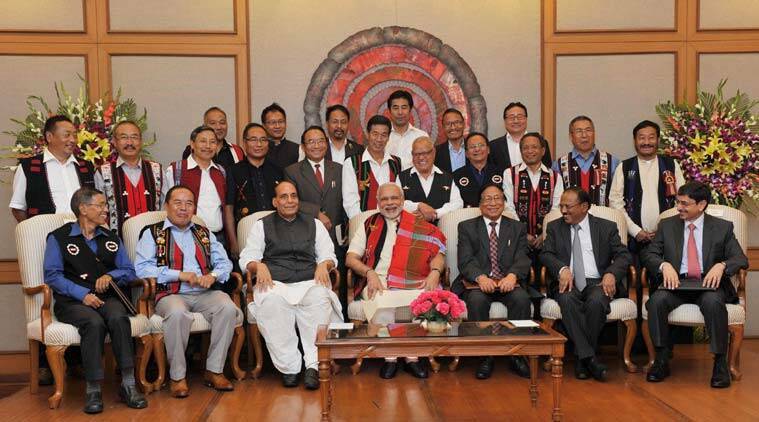 Prime Minister Narendra Modi, Home Minister Rajnath Singh with leaders of the NSCN(IM) in New Delhi (PTI photo) Despite repeated assurances from the Union government that the territorial integrity of Manipur, Arunachal Pradesh and Assam will be maintained and the peace accord recently signed between the Centre and the NSCN (IM) will not affect these states, tension has been palpable in Manipur since August 3. Both Chief Minister Okram Ibobi Singh and Deputy Chief Minister and Home Minister of the state G Gaikhangam (himself a Naga) have maintained that they had been kept in the dark and had not been consulted before the signing. Any other month in any other year, the secrecy of the peace accord would have been enough to spark violent protests among the non-Nagas in the state – the dominant Meitei community who inhabit the four districts that constitute the Imphal valley, and Manipur’s third largest community the Kuki tribe. But despite headlines in Manipur’s local dailies and Manipuri sentiment being dominated by the present Inner Line Permit agitation and demand, underneath lies a slowly simmering anger about the peace accord. In 2001, the Centre had to quickly clarify the terms and conditions of the ceasefire signed with the NSCN (IM) as Imphal valley erupted in violent communal riots in protest against the ceasefire. The ceasefire was to be valid for all Naga area without territorial limits. 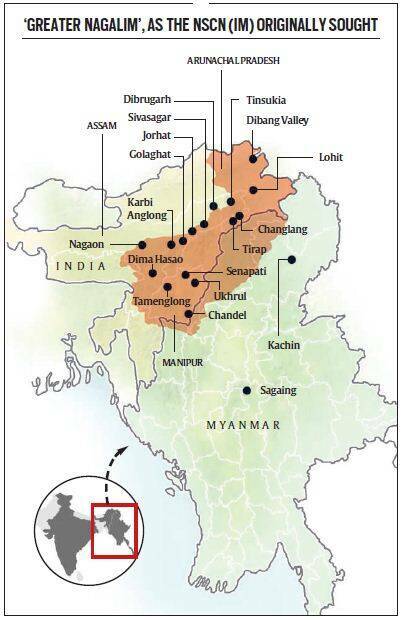 Manipur reacted to it as an implicit threat on its territorial integrity – an acceptance on the part of the Indian Government that all Naga areas were considered one. The Chief Minister’s residence was attacked as was the Secretariat, government buildings were set afire and mobs ran amok. To this day the violence of the June 18, 2001 protests are marked as yearly anniversaries across the Imphal valley. There are four Naga districts in Manipur – Senapati, Ukhrul (where NSCN (IM) General Secretary Th Muivah hails from), Tamenglong and Chandel which cover vast expanses of Manipur’s land. The fear in 2001, as is today, is that the land will be handed over to Nagaland reducing Manipur to a shadow of a state. Even as Manipur waits and watches, Naga families who have been living in Imphal for decades have already begun considering moving out of the valley and relocating to their original districts and making contingency plans and “escape routes” in case communal riots break out in the near future. The Kuki Inpi – Manipur umbrella Kuki body – has meanwhile issued an open memorandum to the Prime Minister demanding that the peace accord be explained. The Kuki Inpi has said that the “criminal actions” of the NSCN (IM) needed to be addressed before the signing of the accord – a reference to the Naga-Kuki riots which had taken place in the early 90s in which 906 kukis were killed and 3,000 Kuki villages and 100,000 Kukis displaced by the Nagas.